Walter Adolph Georg Gropius (18 May 1883 – 5 July 1969) was a German architect and founder of the Bauhaus School, who, along with Alvar Aalto, Ludwig Mies van der Rohe, Le Corbusier and Frank Lloyd Wright, is widely regarded as one of the pioneering masters of modernist architecture. Gropius was also a leading architect of the International Style. Born in Berlin, Walter Gropius was the third child of Walter Adolph Gropius and Manon Auguste Pauline Scharnweber (1855–1933), daughter of the Prussian politician Georg Schwarnweber (1816-1894). Walter's uncle Martin Gropius (1824-1880) was the architect of the Kunstgewerbemuseum in Berlin and a follower of Karl Friedrich Schinkel, with whom Walter's great-grandfather Carl Gropius, who fought under Field Marshal Gebhard Leberecht von Blücher at the Battle of Waterloo, had shared a flat as a bachelor. 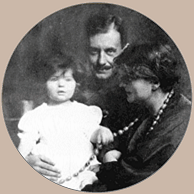 Gropius in 1918, with his wife Alma Mahler and their daughter, Manon. Gropius's Monument to the March Dead (1921) was dedicated to the memory of nine workers who died in Weimar resisting the Kapp Putsch. On 16 October 1923, Gropius married Ilse (later Ise) Frank; they remained together until his death in 1969. The couple adopted a daughter together, Beate Gropius, known as Ati. Ise Gropius died on 9 June 1983 in Lexington, Massachusetts. Walter's only sister Manon Burchard is the great-grandmother of the German film and theater actresses Marie Burchard and Bettina Burchard, and of the curator and art historian Wolf Burchard. Gropius could not draw, and was dependent on collaborators and partner-interpreters throughout his career. In school he hired an assistant to complete his homework for him. In 1908, after studying architecture in Munich and Berlin for four semesters, Gropius joined the office of the renowned architect and industrial designer Peter Behrens, one of the first members of the utilitarian school. His fellow employees at this time included Ludwig Mies van der Rohe, Le Corbusier, and Dietrich Marcks. In 1910 Gropius left the firm of Behrens and together with fellow employee Adolf Meyer established a practice in Berlin. Together they share credit for one of the seminal modernist buildings created during this period: the Faguswerk in Alfeld-an-der-Leine, Germany, a shoe last factory. Although Gropius and Meyer only designed the facade, the glass curtain walls of this building demonstrated both the modernist principle that form reflects function and Gropius's concern with providing healthful conditions for the working class. The factory is now regarded as one of the crucial founding monuments of European modernism. Gropius was commissioned in 1913 to design a car for the Prussian Railroad Locomotive Works in Königsberg. This locomotive was unique and the first of its kind in Germany and perhaps in Europe. Other works of this early period include the office and factory building for the Werkbund Exhibition (1914) in Cologne. In 1913, Gropius published an article about "The Development of Industrial Buildings," which included about a dozen photographs of factories and grain elevators in North America. A very influential text, this article had a strong influence on other European modernists, including Le Corbusier and Erich Mendelsohn, both of whom reprinted Gropius's grain elevator pictures between 1920 and 1930. Gropius's career was interrupted by the outbreak of World War I in 1914. He was drafted August 1914 and served as a sergeant major at the Western front during the war years (getting wounded and almost killed) and then as a lieutenant in the signal corps. Gropius was awarded the Iron Cross twice ("when it still meant something," he confided to his friend Chester Nagel) after fighting for four years. Gropius then, like his father and his great-uncle Martin Gropius before him, became an architect. Gropius's career advanced in the postwar period. Henry van de Velde, the master of the Grand-Ducal Saxon School of Arts and Crafts in Weimar was asked to step down in 1915 due to his Belgian nationality. His recommendation for Gropius to succeed him led eventually to Gropius's appointment as master of the school in 1919. It was this academy which Gropius transformed into the world-famous Bauhaus, attracting a faculty that included Paul Klee, Johannes Itten, Josef Albers, Herbert Bayer, László Moholy-Nagy, Otto Bartning and Wassily Kandinsky. In principle, the Bauhaus represented an opportunity to extend beauty and quality to every home through well designed industrially produced objects. The Bauhaus program was experimental and the emphasis was theoretical. One example product of the Bauhaus was the armchair F 51, designed for the Bauhaus's directors room in 1920 – nowadays a re-edition in the market, manufactured by the German company TECTA/Lauenfoerde. In 1919, Gropius was involved in the Glass Chain utopian expressionist correspondence under the pseudonym "Mass." Usually more notable for his functionalist approach, the "Monument to the March Dead," designed in 1919 and executed in 1920, indicates that expressionism was an influence on him at that time. In 1923, Gropius designed his famous door handles, now considered an icon of 20th-century design and often listed as one of the most influential designs to emerge from Bauhaus. Gropius designed the new Bauhaus Dessau school building in 1925-26 on commission from the city of Dessau. He collaborated with Carl Fieger, Ernst Neufert and others within his private architectural practice. He also designed large-scale housing projects in Berlin, Karlsruhe and Dessau in 1926–32 that were major contributions to the New Objectivity movement, including a contribution to the Siemensstadt project in Berlin. Gropius left the Bauhaus in 1928 and moved to Berlin. Hannes Meyer took over the role of Bauhaus director. The rise of Hitler in the 1930s would soon drive Gropius out of Germany. Before that, however, he did accept an invitation in early 1933 to compete for the design of the new Reichsbank building and submitted a detailed plan. With the help of the English architect Maxwell Fry, Gropius was able to leave Nazi Germany in 1934, on the pretext of making a temporary visit to Italy for a film propaganda festival; he then fled to Britain to avoid the fascist powers of Europe. He lived and worked in the artists' community associated with Herbert Read in Hampstead, London, as part of the Isokon group with Fry and others for three years, before moving on to the United States with his family. Gropius and his second wife, Ise Gropius, arrived in the United States in February 1937, while their twelve-year-old daughter, Ati, finished the school year in England. Though built in 1938, the Gropiuses believed their house could embody architectural qualities similar to those practiced today, such as simplicity, economy, and aesthetic beauty. In designing his house, Gropius used the approach developed at the Bauhaus. The house the Gropiuses built for themselves in Lincoln, Massachusetts (now known as Gropius House), was influential in bringing International Modernism to the U.S., but Gropius disliked the term: "I made it a point to absorb into my own conception those features of the New England architectural tradition that I found still alive and adequate." Helen Storrow, a banker's wife and philanthropist, became Gropius's benefactor when she invested a portion of her land and wealth for the architect's home. She was so satisfied with the result that she gave more land and financial support to four other professors, two of whom Gropius designed homes for. With the Bauhaus philosophy in mind, every aspect of the homes and their surrounding landscapes was planned for maximum efficiency and simplicity. Gropius's house received a huge response and was declared a National Landmark in 2000. Gropius and his Bauhaus protégé Marcel Breuer both moved to Cambridge, Massachusetts, to teach at the Harvard Graduate School of Design (1937–1952) and collaborate on projects including The Alan I W Frank House in Pittsburgh and the company-town Aluminum City Terrace project in New Kensington, Pennsylvania, before their professional split. In 1938 he was appointed Chair of the Department of Architecture, a post he held until his retirement in 1952. Gropius also sat on the Massachusetts Institute of Technology (MIT) Visiting Committee at the end of his career. The well-known architect designed the Richards and Child residence halls on the Harvard campus that were built in the 1950s. In 1944, he became a naturalized citizen of the United States. In 1946, Gropius founded the young architects' association, The Architects' Collaborative (TAC), a manifestation of his lifelong belief in the significance of teamwork, which he had already successfully introduced at the Bauhaus. Based in Cambridge with a group of younger architects, which the original partners included Norman C. Fletcher, Jean B. Fletcher, John C. Harkness, Sarah P. Harkness, Robert S. MacMillan, Louis A. MacMillen, and Benjamin C. Thompson. One work produced by this office is the Graduate Center of Harvard University in Cambridge (1949/50). TAC would become one of the most well-known and respected architectural firms in the world. TAC went bankrupt in 1995. In 1967, Gropius was elected into the National Academy of Design as an Associate member and became a full Academician in 1968. Gropius died on July 5, 1969, in Boston, Massachusetts, aged 86. He had been diagnosed with inflammation of the glands, and was admitted to hospital on 7 June. After an operation was performed successfully on 15 June, there was hope of a full recovery. Gropius described himself as a "tough old bird", and continued to make progress for about a week. However, his lungs became congested and could not supply proper amounts of oxygen to the blood and brain. He lost consciousness, and died in his sleep. Today, Gropius is remembered not only by his various buildings but also by the district of Gropiusstadt in Berlin. In the early 1990s, a series of books entitled The Walter Gropius Archive was published covering his entire architectural career. The CD audiobook Bauhaus Reviewed 1919–33 includes a lengthy English Language interview with Gropius. Upon his death his widow, Ise Gropius, arranged to have his collection of papers divided into early and late papers. Both parts were photographed with funds provided by the Thyssen Foundation. The late papers, relating to Gropius's career after 1937, and the photos of the early ones, then went to the Houghton Library at Harvard University; the early papers and photos of the late papers went to the Bauhaus Archiv, then in Darmstadt, since reestablished in Berlin. Mrs. Gropius also deeded the Gropius House in Lincoln to Historic New England in 1980. The Gropius house was added to the National Register of Historic Places in 1988 and is now available to the public for tours. Bauhaus Center Tel Aviv in the White City recognizes the greatest concentration of Bauhaus buildings in the world. In 1959 he received the AIA Gold Medal. 1926-28 Törten housing estate in Dessau. 1945–59 Michael Reese Hospital, Chicago, Illinois, USA – Master planned 37-acre (150,000 m2) site and led the design for at least 8 of the approx. 28 buildings. 1967–69 Tower East, Shaker Heights, Ohio, was Gropius's last major project. 1968-70 Huntington Museum of Art, Huntington, West Virginia, USA. Original building expanded with Gropius addition with little alteration to the original structure. Only American art museum to be brought to completion using a Gropius design. 1973–80 Porto Carras, at Chalkidiki, Greece, was built posthumously from Gropius designs, it is one of the largest holiday resorts in Europe. NB: The building in Niederkirchnerstraße, Berlin known as the Gropius-Haus is named for Gropius's great-uncle, Martin Gropius, and is not associated with the Bauhaus. ^ "International Style | architecture". Encyclopedia Britannica. Retrieved 2018-09-17. ^ a b "Ise Gropius (-Frank)" Archived 8 April 2014 at the Wayback Machine. bauhaus-online.de. ^ "Walter Adolph Gropius 1883 – 1969". British Broadcasting Corporation. Archived from the original on 4 November 2006. Retrieved 2 August 2006. ^ Paul Davies (30 April 2013) "Walter Gropius". architectural-review.com. ^ "Strange Bedfellows: The Modernists and the Nazis - Los Angeles Review of Books". lareviewofbooks.org. Retrieved 27 March 2018. ^ Lawrence Gowing, ed., Biographical Encyclopedia of Artists, v.2 (Facts on File, 2005): 287. ^ "Walter Gropius". Encyclopædia Britannica. ^ "GSAS Residence Halls" Archived 27 April 2014 at the Wayback Machine. gsas.harvard.edu. ^ "Walter Gropius" Archived 1 April 2014 at the Wayback Machine. bauhaus-online.de. Isaacs, Reginald (1991). Walter Gropius: An illustrated Biography of the Creator of the Bauhaus (First English-language ed.). Berlin: Bulfinch Press. ISBN 978-0-8212-1753-5. The New Architecture and the Bauhaus, Walter Gropius, 1935. The Scope of Total Architecture, Walter Gropius, 1956. From Bauhaus to Our House, Tom Wolfe, 1981. The Walter Gropius Archive, Routledge (publisher), 1990–1991. Wikimedia Commons has media related to Walter Gropius. More information on Gropius's early years at the Bauhaus can be found in his correspondence with Lily Hildebrandt, with whom he had an affair between 1919–22: Getty Research Institute, California. This page was last edited on 12 April 2019, at 02:09 (UTC).